My twins turned 5 this month. FIVE! Ya, I’m still in shock a bit. When we started talking about what type of birthday party they want, it was a definite MINECRAFT answer from both of them! No surprise there, of course. Although this was a few weeks ago, I’m finally getting around to sharing our Minecraft Birthday Party! One thing that I was really excited about is that there’s SO MUCH you can do with a Minecraft party, from the food, to the decor, to the activities…really, it’s crazy how many possibilities you have to work with! I really like not going broke for a 5-year-old birthday party, though, so I kept it really budget friendly and as stress-free as possible. I’m really a fan of making our own invitations because 1. usually I can get them cheaper and 2. they’re totally fun! I made sure to include some Creepers, Steve? and his pup, even an Enderman! There’s a spot at the top of the text area you can write who’s celebration it is, then all the spots for details! Print off the invitation HERE, cut it out and tape/glue the blank sides together. Then just fold on the designated lines, fill in your details, and pass them out. Now get ready to Par-Tay! We had a ton of fun creating the setting for our party! Our awesome backdrop was a huge hit with the kiddos, and was really simple to put up! All you do is get some square plates in 2-3 shades of green and some black. Lay them out on a table or the floor, creating your Creeper pattern. Turn them over, being careful to keep them in the patter you’re wanting, and tape all along the plate backs. Across, down, and diagonal. See how easy it picks up? Then just use little nails or something at the top corners and one in the middle to hold it onto your wall. Easy and fabulous! 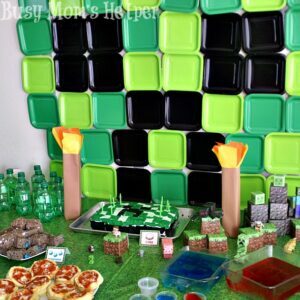 On our tablescape we used these fun Minecraft paper/box sets to really make the place look like the game. They come in sheet patterns that you just pop out and fold together. Great activity idea! I also nabbed this Grass tablecloth, which worked perfect! I hung balloons and put Creeper faces or Enderman faces on them in our kitchen area and at the front door. For the favor bags I just got simple green baggies and taped black construction paper Creeper faces on the front! I found these awesome swords and pick-axe and the kids LOVED them! Perfect for the decor, then you can use them for a game of ‘fight the Creeper’, then the birthday kid can keep them afterwards. We HAD to get a diamond sword version along with the iron, since my family is kind of obsessed with this game and it just ‘topped it off’. There’s also PLENTY of Minecraft items HERE you can check out, from glowing wall torches, to pins, to spinning Wither and more! I got the fun Free printable food name place cards from Catch My Party. Like I said, you could play ‘fight the Creeper’ with the foam swords, or go ‘digging’ through some boxes with the pick-axes. You could also create your own sword with this fun Free Printable Sword Stencil HERE. My boys seriously LOVED their party, and everyone had a wonderful time. We were also able to keep most of the decor for the kids to enjoy for a long while yet! Even though many of us are barely recovering from Christmas, Valentine’s Day is quickly creeping up on us – crazy, right? With 4 kids in school this year, we’ve got plenty of kids’ Valentines for school to deal with. 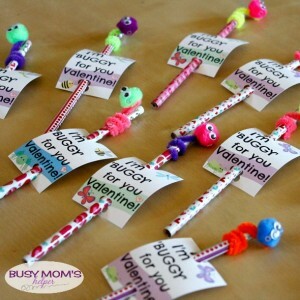 Luckily, these Bug Valentine pencils are a super easy craft, turn out adorable, and we even included the free printables for you! You all know I love joining in Craft Lightning every month – and we’ve done some awesome crafts for every theme! Remember the snowman fingerprint activity last month? For those that don’t know – with this party we only share 15-minute (or less) crafts. I was able to do at least a dozen in that time, so within an hour I had plenty for my kids’ friends. Here’s for not waiting until the last minute – Woot woot! Glue a pom-pom onto each pipe cleaner at the top. Glue 2 googly eyes onto the front. Cut the pipe cleaner to your desired length (or leave it longer, up to you) and wrap around the pencil. Cut out the bug valentine cards. Hole punch at the top and bottom, then slide your pencil through. That’s it – see, I told you it was a super easy Valentine idea! The kids are really excited to give these out – and were glad we did such a variety of colors for their friends to choose from. Now head over to see the other amazing Valentine’s Day crafts for this month’s Craft Lightning! If you missed our other Craft Lightning crafts…. How likely are you to meet a goal without having written it down? Me….no chance! I need it in writing, plus the steps to reach that goal. It keeps me organized and stay on track by having it right there in front of me. Of course I had to include a neat quote along the top! You can print off as many sheets as you need, and they match perfectly with our Free Printable 2018 Planner & Calendar and FHE Planning Pages! My favorite feature of the sheets is that there’s a line for the overall goal, then you can break down the steps below. If you’re like me, a goal seems much more achievable if I can see the baby steps instead of a giant leap! To download and print our fun goal printable, be sure to sign up for our newsletter as it’s one of our many subscriber-exclusive printables! 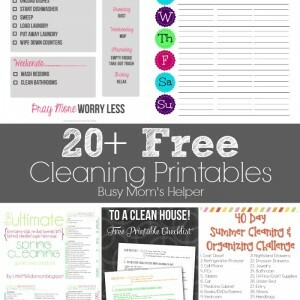 Just sign up, and you’ll receive an email with the link to get your free printables! January means planning for a lot of people – looking at the year ahead as we make goals and schedule our events. Online calendars are just great, but there’s just something about the good ol’ paper ones that I absolutely love! 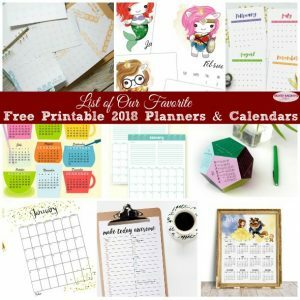 I thought it’d be fun to put together this List of Our Favorite FREE Printable Planners & Calendars for 2018 to share with y’all! Not only do I use my own Free Printable 2018 Planner for my weekly planning and blog scheduling, but I have a big desk one and even use an online Google Calendar – because that’s the only method hubby can keep up with, so I need to add our family things on there as well. Overload, you may think – but this is what works for me and helps me stay on top of my many to-dos and scheduling for family, self and my work. Check out the below list of FREE printable 2018 planners and calendars to find one that fits your style AND your scheduling preferences! Who does a weekly Family Night? We’ve sort of tried to in the past, but I could count the number of times we actually followed through on one hand. Pretty sad! This year I want to really make a better attempt at it, despite our crazy schedules with dance, karate, school and work! 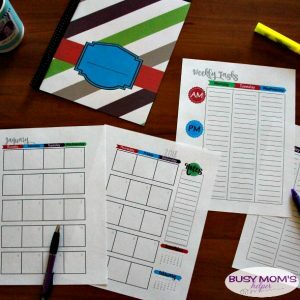 I know I need to be a lot more organized to pull this off, so I pulled up this awesome Printable Family Home Evening Planner for Busy Moms from few years ago to use! The colors & style match really well with our 2018 Free Printable Planner, so you can stick it right in with the other fabulous pages! This 2-page printable for Family Home Evening has spots for practically EVERYTHING I need to successfully plan and prepare for your fun night together! There’s sections for keeping track of assignments…. At the top you can put the Theme for that month, and there’s a handy NOTES section at the bottom of one page! I love that there’s a cute section just for Family Goals, since we’re working on some things together as a family this coming year. Teamwork all the way! On the right page of the spread, you can fill in each week’s specific TOPIC, so preparing the lesson will be that much easier! I really enjoy quotes, so I even included a specific area where you can fill in a theme-appropriate (or just one you really like!) to give some thought and inspiration during the month. Along the line of loving quotes….I put two WONDERFUL family quotes from Uchtdorf (one of my favorite speakers) and one from Thomas S. Monson along the bottom of each page! I know this planner will be uber helpful this coming year, and can do wonders helping us keep up with our goal! It’ll take a little time getting use to it, especially when the younger kids have the lesson and need ‘some’ help. I’ll try to look at it as a great learning time and quality teaching moment, hopefully that’ll make me a little less short-tempered! I know it’ll be great, though, and can’t wait to start learning even more about the gospel with my sweet family! 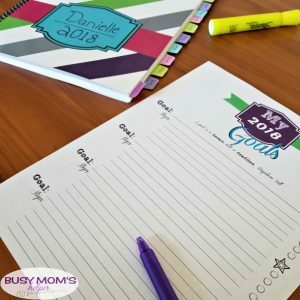 Don’t forget to check out our full 2018 Free Printable Planner for busy moms! Get ready to ring in the new year with the family, including the kiddos. It’s time to look back on 2017 and plan for a wonderful 2018! 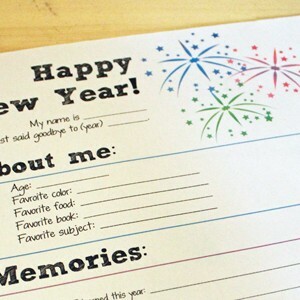 Give the kids this New Year’s Eve printable to fill out their best memories and resolutions. Do you make a New Year’s resolution every year? How about your kids? I think it’s really important to set goals, no matter how old you are. As parents, we can help our kids choose goals that are realistic and also fun to accomplish. Whether you let them stay up until midnight or not quite that late, this New Year’s Eve printable can be a fun family activity. Sit down together and talk about your memories from the year and what things you want to do or are looking forward to next year. This printable is fun and would make a great keepsake. The first section is a little “about me” to capture what your child loves now. The middle area includes three spaces for memories from the past year and at the end, there is space to make resolutions for next year. I wanted to keep this simple and my kids really prefer to write with a prompt. I think making resolutions is hard for kids and adults when you don’t have guidelines. I mean, there’s so much you could do, right? So I included little prompts on each line to get the kids started. To print your New Year’s Eve page, click HERE. Although I made this with elementary-aged kids in mind, I think older kids and adults will have fun with it too. I think it would be really fun to do these every year (so there’s no date on this printable!). I love being able to look back and ahead at the same time. If you’re looking for something more goal-driven, this New Year’s goal printable is perfect for that. It has space to write in a single goal, plus everything you need to do to reach it. I think it goes really nicely with the New Year’s Eve printable for kids, if you want to use both. How are you celebrating New Year’s Eve with your family? Okay guys, I know I usually have our yearly planners out at the start of the school year, but I’m SUPER behind this year. Better late than never, right? After hearing plenty of feedback from last year’s version, we stuck with the clean design with colorful accents, but tweaked our weekly tasks pages a bit to better go with what many of you were looking for. You can nab our Free Printable 2018 Planner for Busy Moms, and get your scheduling and to-do lists more under control for the new year! While I always worked with planners that started on Sunday, I heard a vast majority of you asking for it to begin on MONDAY instead – wish granted! Also, we have the days organized along the top of the page, and then several lines down, with AM, PM or EVE (evening) along the edge. 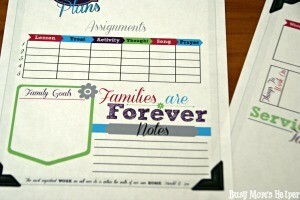 This will give more freedom and room for writing down the many tasks we tackle each week! Many of you said you didn’t care much for the dates for each day all year long, either – asking instead for it more general in case you need/want to make copies during the month. Again, we made that change! I’m really happy with the cleaner look and more lines and space for writing in. For our monthly spread, we didn’t hear any big requested changes by the larger portion of you, so kept it the same. Large squares allows for writing in important dates or events, with a section along the right side for taking any notes. At the bottom right corner you’ll find the previous month as well as the following month, so you’re not having to flip back and forth much while handling your planner. Since we’re so late getting this out this year, we didn’t worry about starting in August – after all, most of you won’t be going BACK to write things in for the previous few months, I assume. As such, this 2018 planner will go from January through December 2018. In each pdf, it has the front cover with a blank back, then a 2-page NOTES spread. After that is the monthly spread of January, followed by the weekly tasks for January, then the February monthly calendar spread, then February’s weekly tasks spreads……and so forth through December. After the last week of December’s tasks is a 2-page NOTES spread, then 1 page of NOTES – then a blank page to be the inside of the back cover. To get your PDF download of our free printable 2018 planner, just sign up for our newsletter below – it’s one of our FREE subscriber exclusives! I hope you love our free printable 2018 planner as much as we do! I know we can’t meet EVERYONE’S tastes, but we certainly try to appeal to the majority of our readers. Let us know your feedback in the comments so we can make the 2019 planner even better! Click the little tag in the image below for easy shopping & to nab your own Philips® Sonicare DiamondClean Smart 9300 Rechargeable Toothbrush! 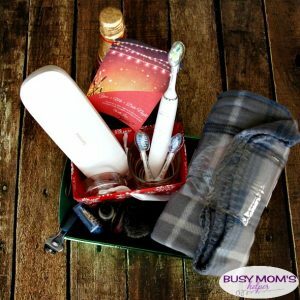 When choosing what to include in your date night gift basket, keep in mind things that not only would be useful during your date – like a blanket, sparkling cider, gift card to a restaurant or movie passes, but also things to help your significant other get ready for your special night. I put some new shave stuff in for my hubby, knowing how he likes to have a clean shave before we get to go out (and he knows I love it, too!). He’s also really careful with his oral care, so I was thrilled to give him the Philips® Sonicare DiamondClean Smart 9300 Rechargeable Toothbrush. The Sonicare DiamondClean Smart 9500 Rechargeable Toothbrush was named one of Oprah’s Favorite things in 2017, so I was sure this one would be perfect, as well! I love seeing the items she includes each year, and know this will be a great gift for anyone on your holiday shopping list. You can even nab it off Amazon, so no need to go to the store! I got my first Philips Sonicare for Mother’s Day a couple years ago, so have learned that they’re a great brand that I trust to follow there’s saying ‘There’s Always a Way to Make Life Better’. I can see why it’d be included on this year’s list, because the Philips Sonicare DiamondClean has 4 modes plus 3 intensities to let you focus on each aspect of your oral health, with the premium brush heads giving you exceptional results. We all have different needs, right? With this, the sensors and app help you perfect YOUR technique, giving you a complete clean. The Sonicare app even gives you real-time feedback and personalized coaching – that alone can be the perfect holiday gift! Other ideas could be their favorite candies, a new shirt to wear on the date, a favorite cologne, or maybe a CD with music from when you started dating. There’s so many different things you could do, so feel free to customize it to your significant other – just like Philips Sonicare DiamondClean helps you customize your oral health care! After you’ve decided on the gifts you’ll include in your date night gift basket, be sure to get a box, basket, or container that will FIT it nicely. I did a smaller basket inside a larger one to add some dimension – I’ve always been a fan of attractive gifting and wrapping! Don’t forget to sign your name at the bottom! For some extra fine, you can even write a sweet, thoughtful or funny message on the back of it! Sorry, not sharing a photo of my message to hubby 😉 Then get a ribbon and attach the tag to your date night gift basket. That’s all it takes, and you’ve got SEVERAL gifts for your honey – plus the promise of a date night for you BOTH! If you want to wrap it all up as a surprise under the tree, you could also do colored tissue paper inside cellophane wrap around it – making it one big, carefully wrapped gift to sit there and tease your hubby as to what’s inside! I didn’t wait until Christmas for ours, but love the idea of wrapping it up like that so he has no clue what it is. Oh – and don’t forget to line up a babysitter, if needed, so there’s no obstacles in your way for a wonderful date night this holiday! Give the gift of superior sonic technology and even treat yourself to a great date night! Learn more from Philips Sonicare on their Facebook, Pinterest, Twitter, Instagram or even Youtube! My dad owned a pizza shop when I was younger, so it was always expected that we’d have pizza at our parties. Not that I’m complaining – it was a hit! 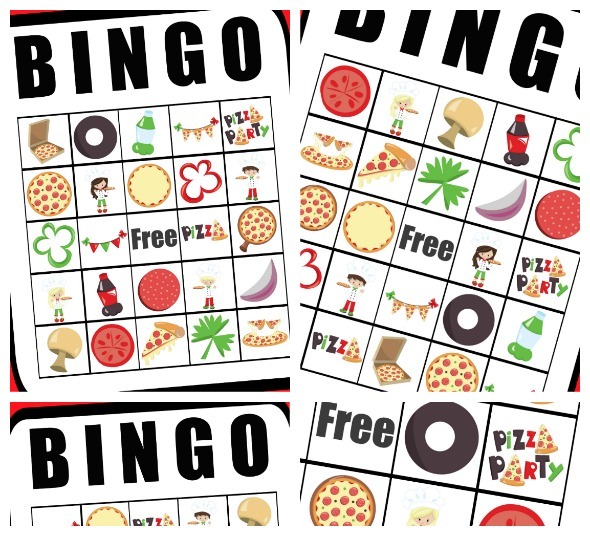 These fun Free Printable Pizza Party Bingo cards would be just the ticket to go along with any party – pizza themed or not – when you’re serving a delicious, hot pizza! Aren’t these super fun? And you could do a pizza party theme ANY time of year – it’s so flexible! Plus what kid doesn’t like pizza? 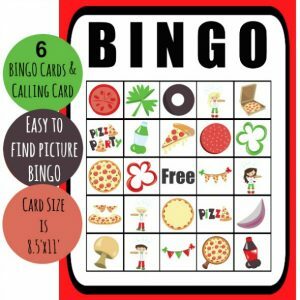 The printable packet comes with 6 different pizza party bingo cards, plus a sheet for the ‘master’. Little pizzas, toppings, soda and other themed photos accent these great cards that you can nab for free – just sign up for our newsletter below and you get access to all our subscriber-exclusive printables! Join our newsletter for access to fun, free printables – plus great discounts throughout the year! Success! Now check your email to confirm your subscription, then wait for fun newsletters with access to free printables & great discounts throughout the year! Aren’t they cute? Plus you can nab the printable for FREE, so it’s not a huge project of tracing or anything. See, told you it was super easy. They come 4 to a page so they’re the perfect size for many of the popular Halloween candies. 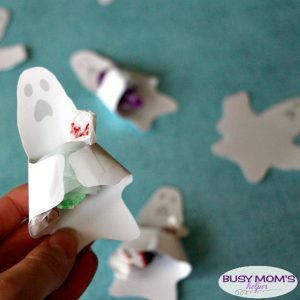 You could also cut out colored paper and tape the back of the ghost on it for more of a ‘3D card’ type look, but I liked the simplicity and size of just the ghosts for my own. I’m really excited to share this treat huggers with all the trick-or-treaters this Halloween, and know my kids will want to enjoy some themselves – of course! What’s YOUR favorite treat or toy to give on Halloween? Some people go all-out for Halloween decorations, while others prefer to keep it simple. Whichever group you fit into, you’re sure to love these adorable Free Halloween Printables! 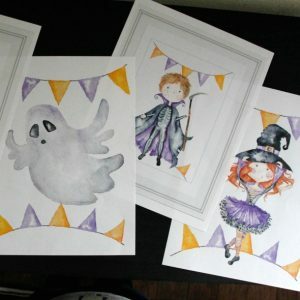 Little witch or skeleton, friendly ghost and fun banners make these the perfect printables for decorations, gift tags, door signs and much more. This little girl ballerina-witch is super cute, as is this fun skeleton-reaper boy all ready for trick-or-treating! The ghost could be friendly or spooky, depending on what other decor is around to bring out his ‘mood’! The kids and the Happy Halloween prints come in both the banner borders and the frame options. To nab these festive, Halloween printables just sign up for our newsletter below – you’ll get access to these and all of our other subscriber-exclusive printables and discounts! Start getting into the trick-or-treat mood with these awesome Halloween Printables today!